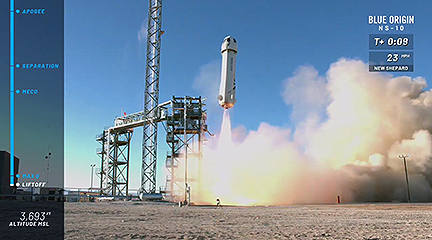 Blue Origin's New Shepard rocket liftoff. 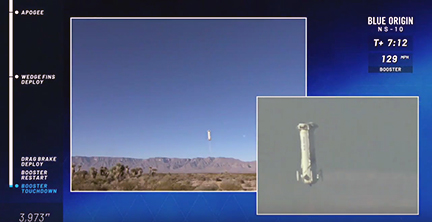 Blue Origin's New Shepard reusable launch system was launched and landed at Blue Origin’s West Texas Launch Site, on January 23, 2019, at 15:05 UTC (09:05 CST). This was the fourth mission, launch and landing, for this New Shepard launch vehicle. For Blue Origin’s mission NS-10, the New Shepard Crew Capsule 2.0 transported nine NASA-sponsored research and technology payloads — see the information below for payload details. The return of the New Shephard rocket.